"I really need to go for an overnighter soon, work is getting on my nerves." Peter came to my home with car and we started our little adventure there. 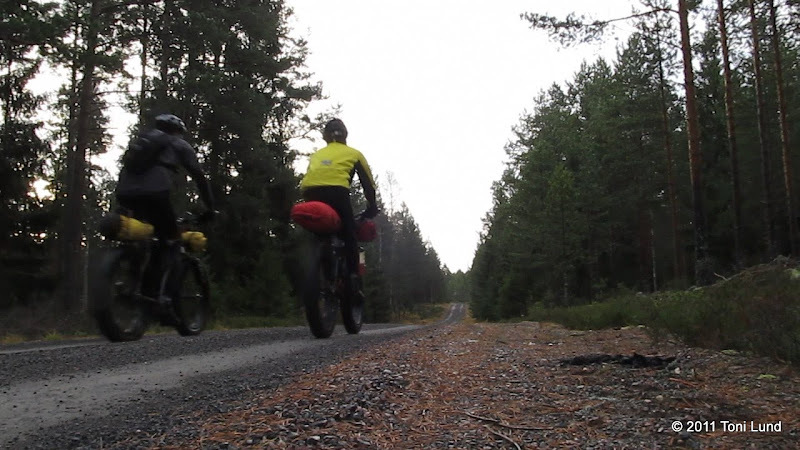 A fatbike rolls much more easily on asphalt and gravel with higher tire pressure. When we arrived at Marttila, Peter dropped the tire pressure for better grip and a little suspension that the huge tires gives. 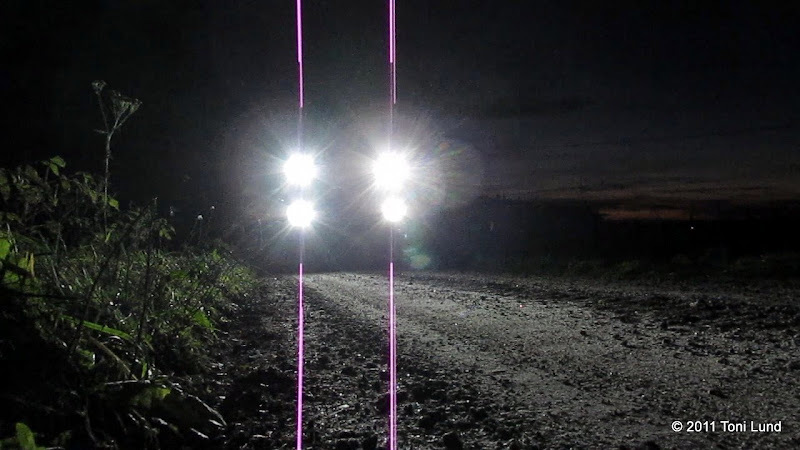 Riding in the dark is a lot of fun with powerful lights. The trails were really technical at some places and there were some big rocks so some bike pushing was necessary. Getting closer to the lean-to of Lotikko. Peter started a campfire and I did a little more firewood. The sky was clear so we took some experimental photos of the stars. Not bad. We went to sleep just before midnight. The temperature dropped to +4°C from the +8°C. My McKinley Yukon 3-season sleeping bag is really comfortable in these conditions, and with an extra pair of regular socks and a pair of wool socks my feet stayed warm. I slept fairly well, especially the first part of the night. Because of the daylight saving time change we had an extra hour more time. In the morning it was time for the usual coffee and porridge chores. The views from the shelter. A very nice place indeed. We figured out that we would get back to the gravel road by riding the trail ahead. And we had very nice sunrise. And then back to home. It was great outing again. These small adventures are a real pleasure for all senses. It's like immersing with good music. It's no wonder that it's easier to live the hectic everyday life when you can have spare time like this. Thanks Peter for the company, and check out his report and brilliant photos! I took some video clips also, and I will try to edit a video later. Here are some more photos.